1.- Grated or chopped the carrot. Once grated, we put it in an American blender. We add the oil and grind everything. You can also shred with a hand blender. 2.- In a bowl, we put the eggs. We beat them a little with a fork or a stick and add the sugar. We beat again for a couple of minutes more. 3.- We incorporate the carrot paste and oil that we had prepared in step 1. Now, we put the flour and the yeast in a sieve or sieve. From here, we add both ingredients to the bowl. Thus, we make sure that they are well sieved and fine. Finally, add a pinch of salt, which will enhance all flavors. 4.- With a spatula of kitchen, we mix carefully all the ingredients. Until we have a paste, something dense, and orange. 5.- We cover the base a removable mold for cakes with baking paper, or vegetable paper. If you do not have a removable mold, it also serves an elongated, biscuit. 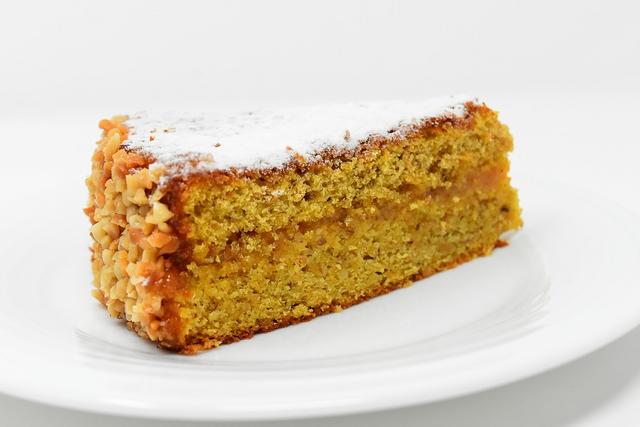 If it is not removable, spread it with a little oil and flour (in this order) so that the carrot cake does not stick afterwards, when baking. 6.- Put the pasta inside the mold and introduce it in the oven, previously heated to 180ºC, heat up and down. We let it bake around 30 or 40 minutes. Until we can introduce a toothpick. If it comes out clean, it's cooked. Remember not to open the oven during the first 15 minutes of cooking or if not, the cake will go down. 7.- Once baked, remove the mold from the oven. We wait 10 minutes to temper a little and unmold. Let it sit on a rack, until it cools completely. excellent combination a rich dessert with vitamins. You just received a 25.15% upvote from @honestbot, courtesy of @punjolife! You got a 23.38% upvote from @moneymatchgaming courtesy of @punjolife! Please consider upvoting this post to help support the MMG Competitive Gaming Community. You got a 24.42% upvote from @whalepromobot courtesy of @punjolife! This post has received a 25.00% upvote from @aksdwi thanks to: @chotho. You got a 21.76% upvote from @whalecreator courtesy of @punjolife! Delegate your Steem Power to earn 100% payouts.